The current tax code is a disaster and needs to be reformed for all Americans. President Donald J. Trump is committed to bringing historic tax relief to the American people based on four key ideas ? cutting taxes for every day Americans, simplifying the tax code, giving business the competitive edge, and investing in America. 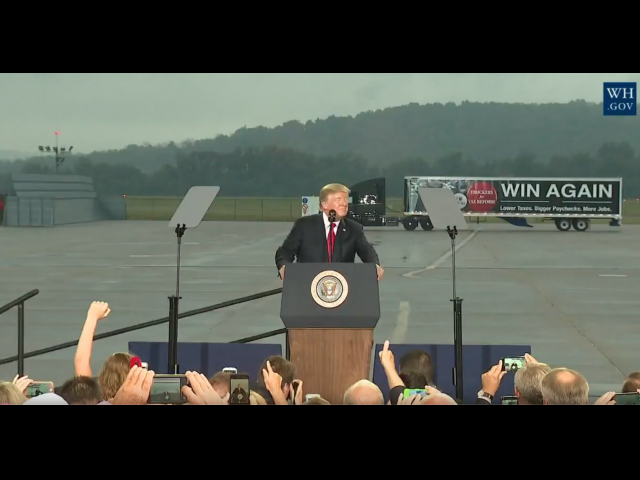 Today, President Trump is traveling to Harrisburg, Pennsylvania, to deliver this message on tax reform to the American Trucking Association. Harrisburg, Pennsylvania ? Today, leaders with the American Trucking Associations joined President Trump in calling on Congress to quickly act on comprehensive tax reform as a way of growing the economy and creating jobs. “While trucking sustains the vitality of the U.S. economy, we also carry a heavy tax burden, paying the highest corporate tax rate of any transportation mode,” said ATA President and CEO Chris Spear. “That is why we joined President Trump at today’s event, in support of his plan to reform our tax code. We urge Congress to follow the President’s lead and pass tax reform by year’s end. “Hearing the President specifically call out the benefits of tax reform for ATA’s members and the trucking industry underscores the need for this effort. We urge Congress to work with the President to achieve the goal of reducing the rates families and small businesses pay in taxes,” he said. Spear was joined at the event in Harrisburg, Pennsylvania, by several ATA members, in support of the tax reform effort. “Few industries are as connected to every facet of the American economy as trucking. From that vantage point, we can see clearly what the President’s tax reform plan would do to drive our economy,” said ATA Chairman Kevin Burch, president of Jet Express Inc., Dayton, Ohio. “Every day, we proudly do our job to move America forward. We join the President in calling on Congress to do the same.